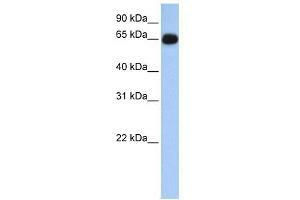 ALAS1 antibody used at 1 ug/ml to detect target protein. Background Delta-aminolevulinate synthase (ALAS, EC 2.3.1.37) catalyzes the condensation of glycine with succinyl-CoA to form delta-aminolevulinic acid. This nuclear-encoded mitochondrial enzyme is the first and rate-limiting enzyme in the mammalian heme biosynthetic pathway. There are 2 tissue-specific isozymes: a housekeeping enzyme encoded by the ALAS1 gene and an erythroid tissue-specific enzyme encoded by ALAS2.